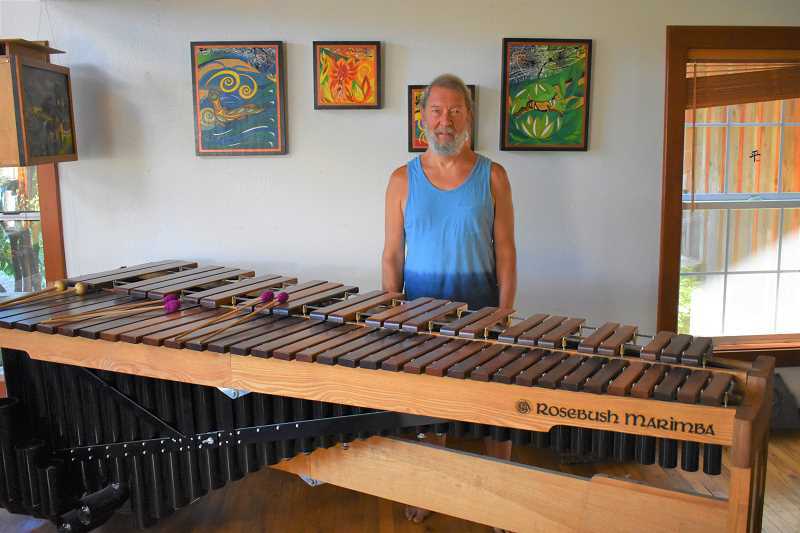 In 1985, Peter Bush saw an artist selling marimbas at the Oregon Country Fair in Veneta and was inspired to make one of his own. Now, more than 30 years later, he's sold his instruments to schools across the country. "I had seen marimbas play at the country fair, and they looked so simple and I loved the sound of them," he said. "I just bumbled into it." Along with connecting schools with marimbas, Bush often has the instruments and other art on display at local events like the Winter Artisan Show, Estacada Uncorked and the Estacada Summer Celebration. A marimba consists of wooden notes with pipes underneath them. When creating the instruments, Bush begins by working with the pieces of wood that will eventually become the notes. The pitch of each note is controlled by the length and thickness, and Bush saws and sands each piece of wood accordingly. "(Marimbas) start with longer notes and they get shorter and thicker as they go up in pitch," he said. He then makes a frame to hold the notes and moves ahead with tuning the pipes. The pipes on a marimba are similar to panpipes. Each individual pipe is tuned to the same pitch as the wooden note above it, and the pipes amplify the sounds from the notes above them. Bush's favorite part of the process is tuning the notes. "It's the most important part. Getting a nice set of clear notes is very rewarding," he said. Bush has sold marimbas to schools across the United States, including Estacada High School and Springwater Environmental School in Oregon City. "I love the fact that it's helping kids learn about music. That's just an awesome thing," he said. Bush's most popular instruments are two octave diatonic marimbas, on which the notes correlate to the white keys on a piano. One of the largest marimbas he creates is the five octave chromatic, on which the notes correlate to a piano's white and black keys. Bush found inspiration for another creation, Marbelous Mazes, when determining the best way to use the extra scraps of wood from the marimba making process. The mazes consist of wooden blocks and ramps for marbles to run through. "I like the unlimited creativity you can have with them," he said. "It's almost impossible to build the same (maze) twice. It stimulates creativity and problem solving for kids." Bush has a degree from the Rhode Island School of Design and moved to the Estacada area in 1984. He discovered the Oregon Country Fair when visiting his sister, Kolieha, who had moved to the area several years prior. "The Oregon Country Fair is one of the biggest reasons why I'm here," Bush said. "It's the cultural highlight of the year. There's a wealth of creative energy." 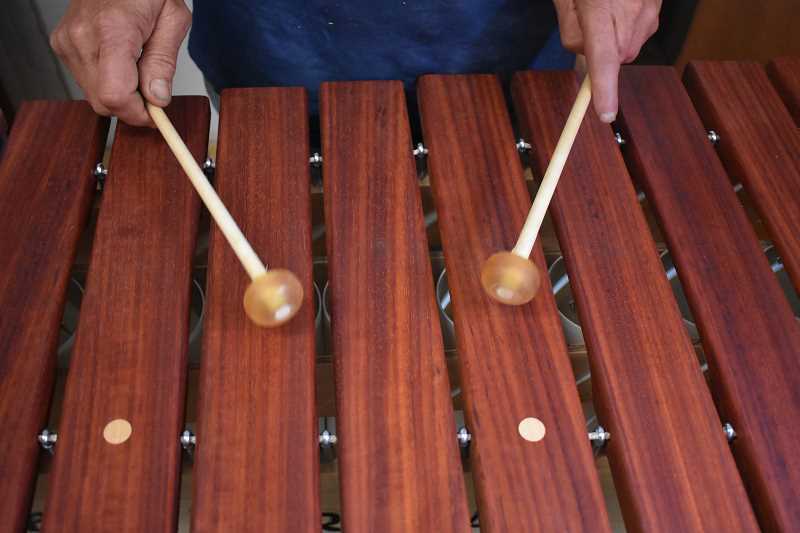 Three years after Bush saw the marimbas that inspired him to create his own, he sold one to the artists who had initially created them at the Country Fair. "You get all sorts of creative ideas and meet great people (at the fair)," he said. For more information about Peter Bush's marimbas and Marbelous Mazes, visit www.rosebushmarimba.com.